Purchasing a courtyard paver is a great way to honor family and friends, commemorate memories and events, or to publicize your organization or business. Your purchase of a courtyard paver also contributes to PPLD's Tri-Building project, providing 21st Century Library service through innovative library spaces and technology for everyone in our community. 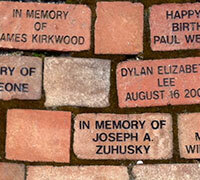 Commemorative pavers are now available at Fountain Library! Click here to purchase East Library paver! Click here to purchase Fountain Library paver! Click here to purchase Library 21c paver!